Christmas 2018 is well underway! And I have some big plans to cover some big Christmas attractions across East and Northern Alabama this season. In this post, I am highlighting the top Christmas attractions that I have plans to cover before Christmas Day. Most of these attractions are free or come with a small fee. And all of these attractions are family friendly. Here is the list I plan to cover, weather permitting of course. Every year, a house on McIntosh Road in Oxford goes all out on the Christmas fun! 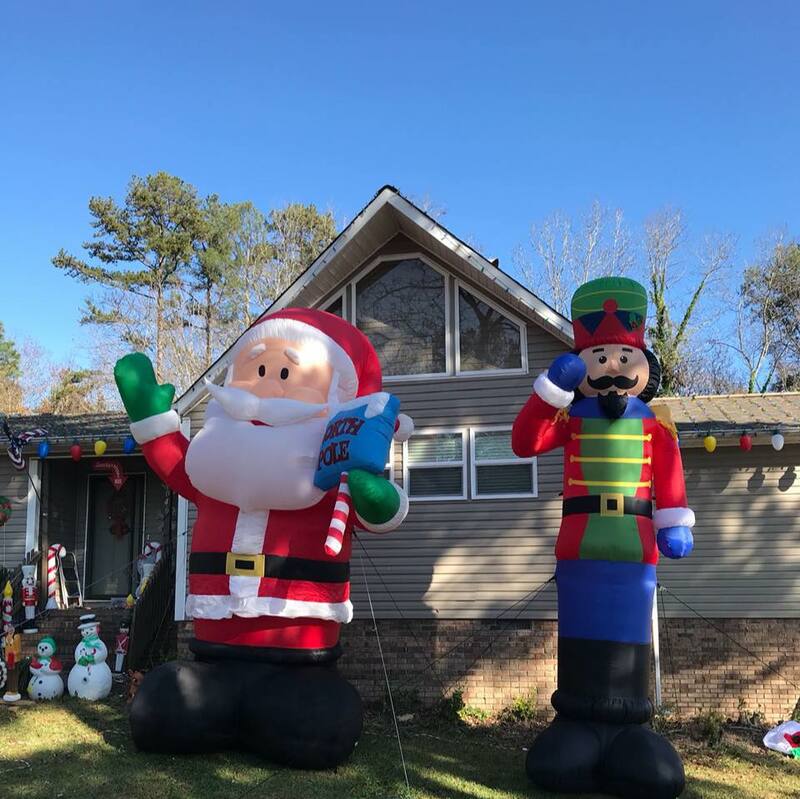 From plenty of Christmas decorations and lights, giant reindeer, and a Santa sleigh all out in the front yard! Avery Robertson plays the role of Santa Claus, and every night until December 23rd, he goes out and waves to traffic passing by on the road. People can stop at this attraction and kids can sit on Santa’s lap and get goodie bags. Plus, you can walk around and enjoy the Christmas decorations while sipping on hot chocolate. 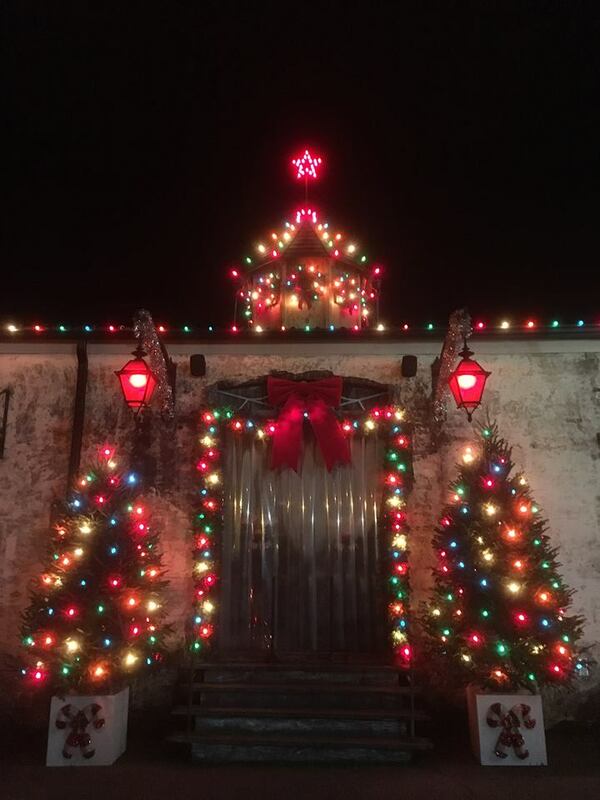 One of the newest Christmas light displays is called Christmas At Bubba’s just east of Piedmont. 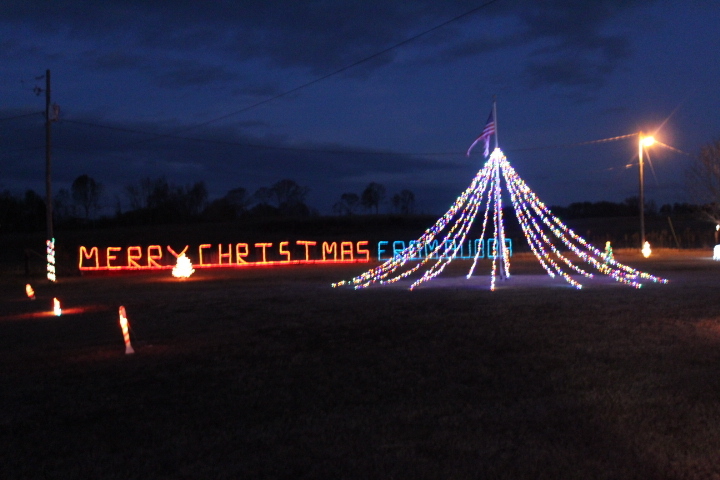 Located in Vigo, Alabama at the foot of Duggar Mountain, Christmas at Bubba’s is a light display for all ages. You can drive around the property or park your vehicle to walk around and enjoy the views of lots of Christmas lights and decorations. On some nights, the homeowners sell hot chocolate plus coffee and build a bonfire for those who want to warm up. 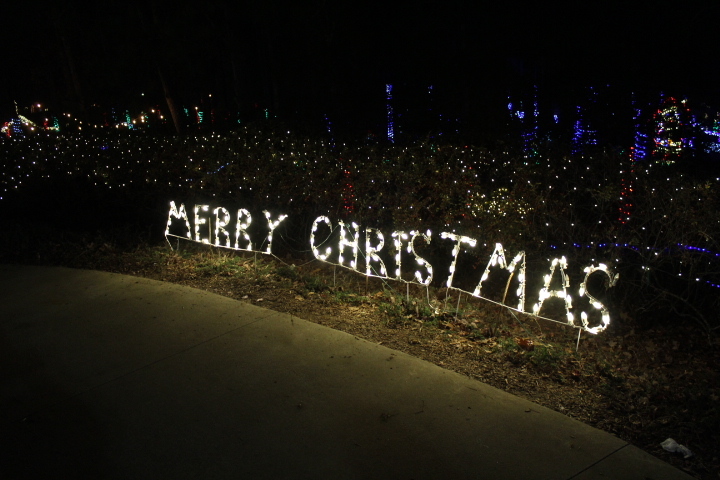 Each year, the City of Gadsden puts on a major Christmas light show at Noccalula Falls Park. Enjoy riding the train or stroll through the park and experience the lights and sounds of the season. During your stroll enjoy over a million lights, the Christmas Story, photos with Santa (until Christmas), cookies decorating, sipping hot chocolate, visit the petting zoo, Christmas ornament decorations, and more! And this attraction will be featured on the ABC show The Great Christmas Light Fight. The episode airs on Monday, December 17th. Each year, the City of Anniston puts out Christmas lights in the median of Quintard Ave. (AL-21) in the downtown Anniston area. The lights are on every night. Just see them in the median while you are driving down Quintard Ave. The Cultural Arts Center is happy to present their 23rd annual Festival of Trees. This year’s trees each feature a different First Lady of the United States. The trees are decorated by area schools and non-profits using mostly recycled materials. Also, the Imagination Place has the Let It Snow attraction. Pell City Parks & Recreation Department (PARD) would like to invite everyone to participate in “Lights in the Park” this year. This event is a tradition that provides FREE advertising & shows support for one another within our community. All local companies, non-profit organizations, schools, churches as well as individuals may participate. Thousands drive through to view the displays so we do ask that they be of Holiday theme & in good taste. Kick off the season with the sites and sounds of Christmas with your family! Drive-thru Christmas lights beginning at dark each night for a minimal per person charge. This drive-thru light display is $3 per person; children under 2 are free. This attraction is located in Gadsden. Big Wills Creek Campground is proud to announce that Christmas on the Creek will begin November 23, and continue nightly until December 23rd. 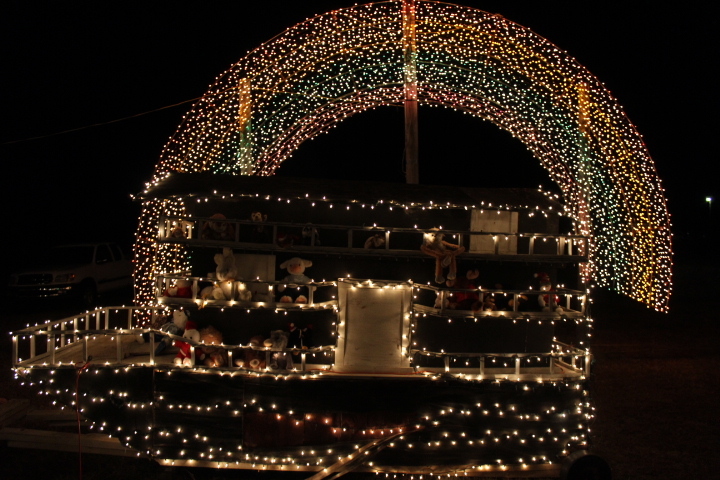 Come take a tour of our light displays throughout the campground. Bring your children to decorate cookies with the elves, write letters to Santa, make a Christmas ornament, and get pictures with Santa. While the children are playing with the elves grab some Hot Coco, Coffee, or Apple Sider and shop for that perfect ornament before the grinch steals them! Watch as the Zoo comes alive for 17 nights of holiday-centric fun at ZooLight Safari presented by Wells Fargo! Be amazed by over one million lights, listen to holiday music and delight in festive snowfalls every night! Enjoy a ride on the Candy Cane Train*, go for a spin on the Jingle Bell Carousel*, experience the thrill of the over 100 foot Yuletide Slide*, ride the Santa Rollers* and so much more. Take in the beauty of a decorated tree reaching nearly 30 feet tall in Trails of Africa as you dance and boogie to special entertainment each night! Come see over 3.25 miles of custom made displays dance to the music played over the radio in your car in perfect synchronization! Also, see Santa and his pals like you’ve never seen them…On vacation! 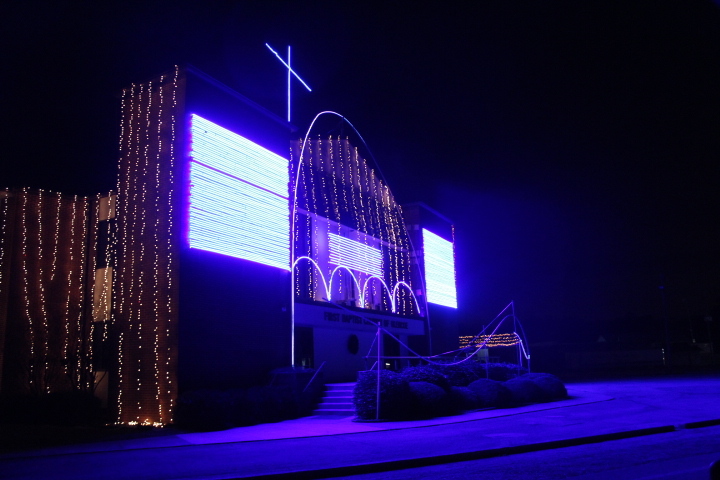 The all-new SANTA’S MOUNTAIN theme features custom built, giant, all-led displays! They are guaranteed to delight everyone from young to old! Railroad Park’s Brrrmingham presented by VIVA HEALTH opens the day after Thanksgiving, Friday, November 23, 2018. Open through January 6, 2019, this year’s rink will bring a magical, wintry atmosphere to the Regions Bank 17th Street Plaza. Take a spin on the ice with the Birmingham cityscape as the backdrop. The Santa’s Underground Workshop is open at Rickwood Caverns State Park near Warrior, Alabama. Over 10,000 additional LED lights have been added for this year along with more Christmas characters. Laser lights and fog have also been added this year. Located in the Huntsville Botanical Garden featuring a nearly two-mile driving route, this holiday light extravaganza showcases larger than life displays, a twinkling icicle forest, Santa soaring over a winter wonderland, and much, much more. A dazzling light display featuring more than 2,000,000 lights at Arab City Park. Live entertainment and old St. Nick visits. Adjacent to the Park, Historic Village includes restored buildings adorned with period decorations and open for holiday tours. Call for specific dates and times of special events.Always begins day after Thanksgiving and continues through December 31.